A living fire in the home is a beautiful thing. Modern gas central heating systems no longer come with gas fires instead you may want to install your own fire, or you may want a stand-alone fire as a centrepiece. 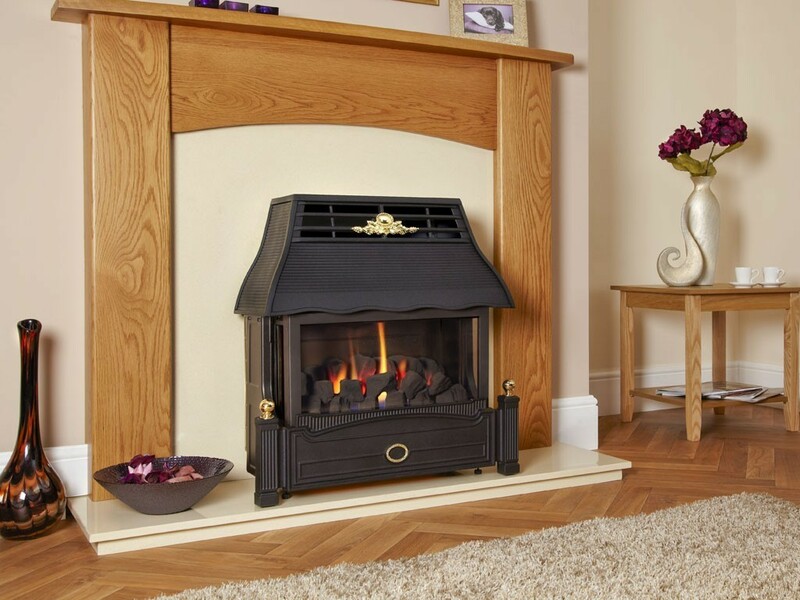 See our Gas Fire Buying Guide. Our gas fire reviews are of fixed mains gas and LPG gas fires. 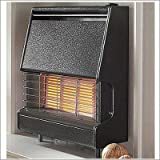 You need a mains gas fire if you are connected to the supply, if you are in a remote location and have an all-electric house or Liquid Petroleum Gas (LPG) system installed then you can use an LPG or Calor Gas fire. A new build home might need a balanced flue system whereas a modern apartment may benefit from a floor or wall mounted flueless catalytic gas fire, all of these come in many different styles. 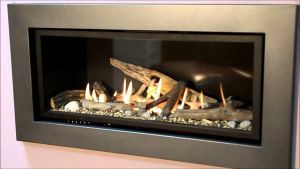 You can find a more detailed explanation of the different types of gas fire on our Gas Fire Buying Guide. With gas fires, you can never compromise on safety, to choose the cheapest is a false economy, at the best you may get an underperforming appliance with a limited lifespan, at the worse you get a dangerous piece of kit which can cause harm to your home and its occupants. Our gas fire reviews are for appliances from reputable manufacturers and we believe offer the best value for money in each category. All mains connected LPG / Gas fires have to fit by gas registered engineers, failure to do so can result in prosecution, as well as causing injury or death to people using the appliance. Visit the Gas Safe Register Website to find a gas safe registered engineer near you, and obtain their advice before making your purchase. Flueless gas fires are the easiest type of gas heater to install but they must never be installed in bathrooms or bedrooms and have minimum room size restrictions depending on the model, check if your selection is suitable for your size room before you buy. 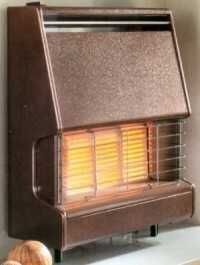 Smeg retro 1950s design wall mounted gas / LPG fire. Our recommended best budget buy is not the cheapest gas fire on the market, we have selected what we believe is the best value for money versatile gas fire available, without compromising on quality or style. This flueless catalytic model is a 'go anywhere' gas fire. available in natural gas (2.5kW or LPG (2.2kW) versions it can be used in any room (not bath or bedrooms) over 12 m3 as long as the room is vented correctly, venting is explained in our Gas Fire Buying Guide. The Smeg Retro is more economical than a traditional fire as flueless gas fires are 100% efficient, the best balanced flue fires are 85% efficient. This means every penny you spend on fuel is turned to usable heat with and none of that heat is wasted by venting it out through a flue. It comes in a variety of colours and you can purchase the surround separately if you are redecorating you can change the surround to suit or choose a neutral colour. 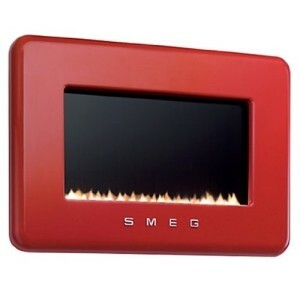 This Smeg gas fire is so easy to fit you can take it with you when you move home. It is made by one of Europes leading manufacturers, Smeg Group, an Italian home appliance manufacturer which has been trading for over 60 years. Smeg UK was established in 1989 and is based in Abingdon Oxfordshire, they have been supplying premium domestic appliances across the UK for more than 20 years. Smeg appliances are widely regarded as tasteful and elegant products which combine effortlessly to compliment your mood and style renowned for good design, robust build and solid guarantees. Dimensions: Height 55cm, Width 80cm Wide, Depth18.6cm. An open-hearth living flame gas fire gives the look and feel of a traditional open coal fire. A fire basket filled with a realistic fuel bed of coals has a living flame dancing over them encompassed by a stylish surround. 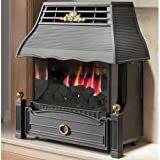 This is the fire of choice for Victorian style houses where the front or living room has a hearth and chimney stack. The gas fire sits in the existing hearth and is flued up the chimney. Focal Point Fires, who also manufacture under the Ekofires brand, is the largest gas fire manufacturer in the UK, they produce an extensive range of flued, balanced flued and catalytic gas fires. or as the Ekofires 3030 'Blenheim' in brass , The stylishly understated design and elegant finish means the 3033 can match any decor. This is a full depth gas fire (depth 180 mm) which fits into a fireplace opening between 375 - 450mm wide and 540 - 575 mm high and is suitable for flueing into class 1 and 2 Chimneys (older brick or steel flued stacks) and has an impressive 3.8kW output suitable for decently insulated rooms up to 60m3. This fire is also available in a shallower depth which is suitable for pre-cast flues and is available as Ekofires Slimline . This gas fire comes with a full 3 years manufacturers guarantee for full peace of mind. This gas fire is suitable for natural gas only. We like this gas fire a lot, finished in Chrome it has the stunning good looks of a contemporary modern appliance, yet holds onto the traditional gas fire feeling, managing a blend of high-tech & comfort. We have found it gives excellent performance and it's made in Stoke-on-Trent in Britain by Flavel. This is a powerful gas fire with a heat output of up to 5.2kW (variable from 1Kw) with an efficiency ratio of 84%, which is about as good as you can get for a traditional gas fire. It has easy to use top mounted electronic controls and has an airwatch system and Flame Supervision Device (FSD) safety features. Our gas fire reviews are not about the cheapest, they the best we can find in a particular category. At just over £1000 we believe this fire is good value for the money. Hole in the wall type gas fires are mounted into a slot cut into an existing chimney breast and are flued up the chimney. 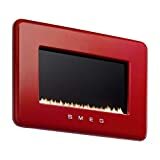 In some cases, walls are built especially to fit this type of gas fire into and a flue is either specially made or a balanced flue model is used. This type of gas fire is usually chosen for aesthetic purposes, as a dramatic signature point in a larger room. We think that it is better to use a superior model that delivers in style, quality and usability than to get a cheaper one that may not fulfil all requirements, which is why we recommend the Pinnacle Royal 860 HE on sale from B&Q. This is a high-efficiency gas fire (85%) delivering a powerful 4.75 kW max heat, enough for a decently insulated 75m3 room. Available in either graphite grey or black trim, glass fronted with a black ceramic lined firebox. What makes this gas fire really stand out is the log effect flame bed, we found the working fire we examined to be stunning (see video below) and it's supplied with a fully sequential remote flame control that adjusts it from a flickering flame to roaring fire, if you are looking for that signature gas fire this is it! You also have the added protection of the manufacturers own 5-year guarantee. Overall size Height 53cm, Width 102cm, Depth 32.5cm. Frame 'lip' (the bit that juts out from the wall) depth 3cm. Picture window: 86cm wide, 39cm high. Cavity recess size: Height 46cm, Width 87.5cm, Depth 30cm. Suitable for natural gas only. The Flavel company was established as an iron foundry in 1777 and have been making cooking and heating appliances for 300 years. Today Flavel gas fires are manufactured by BFM Europe in England in a purpose-built manufacturing plant using the latest technology. All Flavel Gas Fires carry a 7-year comprehensive guarantee against manufacturing & material defects, Inc. parts and labour. 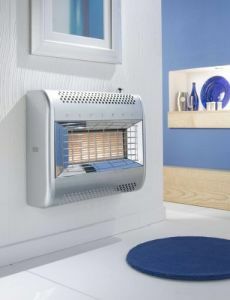 The compact and economical Flavel Firenza can be wall hung or mounted in an existing hearth, the controls are simple and mounted on the top with a push to light dial which rotates to raise and lower the heat, at the maximum output it consumes 5.2Kw and delivers 3.4Kw heat energy, running at 75% efficiency. Available in bronze or black finish. Running costs for this gas fire can be as low as 3p per hour! 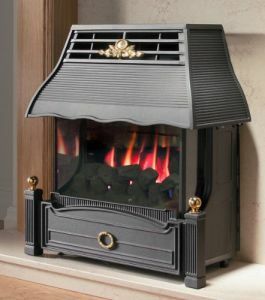 The Flavel Emberglow, 4.3 kW. The Emberglow balanced flue model does not need a chimney and can be fitted on any outside facing wall, or if preferred be mounted in an existing hearth. It is traditionally styled in black with brass detail and has a stunning burning coal effect flame bed. With its coal flame bed and elegant traditional styling, it will enhance any room and creates a stunning focal point. The fire has a 'constant on' pilot light with simple electronic touch controls for lighting the main burner and regulating the heat. At max power it consumes 6kW and delivers 4.3kW heat energy, running at 86.9% efficiency. There are cheaper balanced flue fires available but we believe that this is a top quality, well-made gas fire and with regular yearly servicing, there is no reason why the Emberglow fire cannot last for 20 years +. Standard flued Natural gas and LPG models also available. 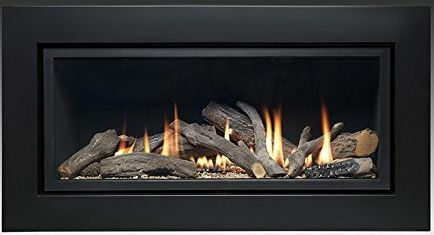 The Flavel Emberglow Gas Fire is an elegant fire with a beautiful flaming coal bed sealed behind its glass front. Most of the Ekofire and Flavel range of hearth type inset fires have a balanced flue option, these are usually fitted into hearths where the chimney stack has been removed, or to create a hearth feature in rooms without a chimney breast. There are multiple options and we recommend browsing the range of these leading companies and choosing the style that suits you. Hole in the wall type balanced flue gas fires are usually mounted a few feet off the ground into an existing chimney breast, or into a purpose made cavity wall made to fit them. 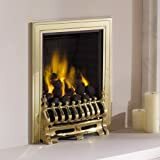 If you do not have a suitable cavity for an inset fire then we recommend using a catalytic wall mounted gas fire, these modern fires are flueless, cheap and easy to install. Since this type of gas fire entered the market many different models have become available, we have already reviewed our best budget buy as the Smeg Retro flueless gas fire, we have also looked at several other models and here are what we think is the best example. Another great design from Smeg. 2kW portrait style LPG fire with black glass and ribbed stainless steel trim.